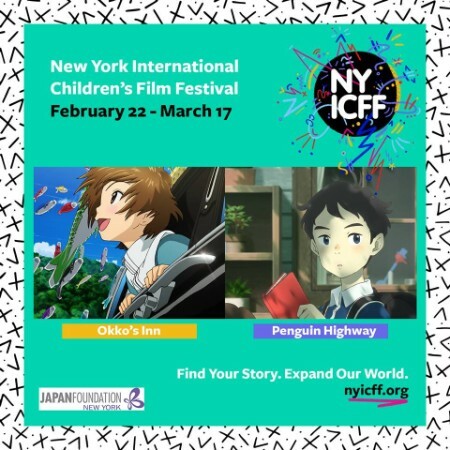 This year’s New York Int’l Children’s Film Festival (NYICFF) showcases two feature-length films from Japan: the World Premiere of Kitaro Kosaka’s Okko’s Inn (2018), a warm and moving film about love, loss, and altruism threaded with equal moments of inquiry and delight; and Hiroyasu Ishida’s winningly absurd Penguin Highway (2018), the first feature from the new Japanese animation start-up studio spun off from Hayao Miyazaki’s stable of younger animators. This film festival is supported through the JFNY Grant for Arts and Culture. Get special discount tickets on the NYICFF website with the code JFNY19.